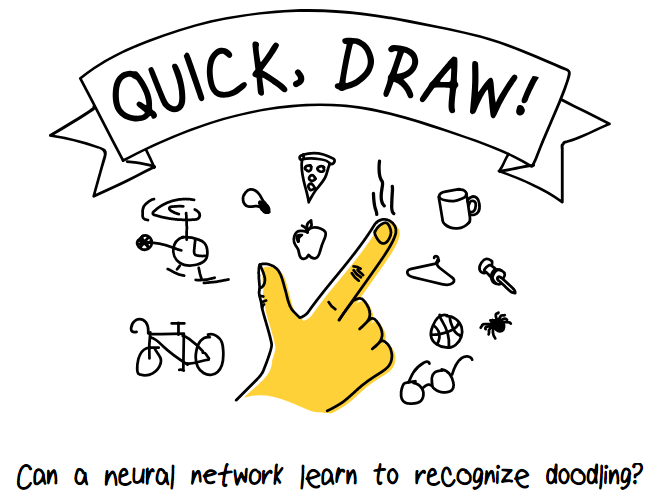 Quick Draw is a drawing game which is training a neural network to recognise doodles. quickdraw is an API for accessing the Quick Draw data - it downloads the data files as and when needed, caches them locally and interprets them so they can be used. Install the quickdraw python library using pip . Here are some examples of how to use quickdraw but be sure to also checkout the API documentation for more information. Open the Quick Draw data using QuickDrawData and pull back a drawing of an anvil. quickdraw will download the anvil.bin data file and return the data for a random drawing of an anvil (well a doodle of an anvil anyway). Drawings are returned as QuickDrawing objects which exposes the properties of the drawing. You can save the drawing using the image property. You can open a group of Quick Draw drawings using QuickDrawDataGroup passing the name of the drawing (“anvil”, “aircraft”, “baseball”, etc). By default only 1000 drawings are opened, you can change this by modifying the max_drawings parameter of QuickDrawDataGroup, setting it to None will open all the drawings in that group. To iterate through all the drawings in a group use the drawings generator. You can get a list of all the drawing names using the drawing_names property of QuickDrawData. Code examples can be found in the quickdraw GitHub repository. The drawings have been moderated but there is no guarantee it’ll actually be a picture of what you are asking it for (although in my experience they are)! Beta - stable, under active dev, the API may change. © Copyright 2018 Martin O'Hanlon. Revision 61d8413e.